No one wants frown lines to define their facial appearance, but many of us end up with these bothersome wrinkles before we know it. Dysport® is an injectable neurotoxin that softens moderate to severe frown lines for up to 4 months, helping you look more naturally refreshed. 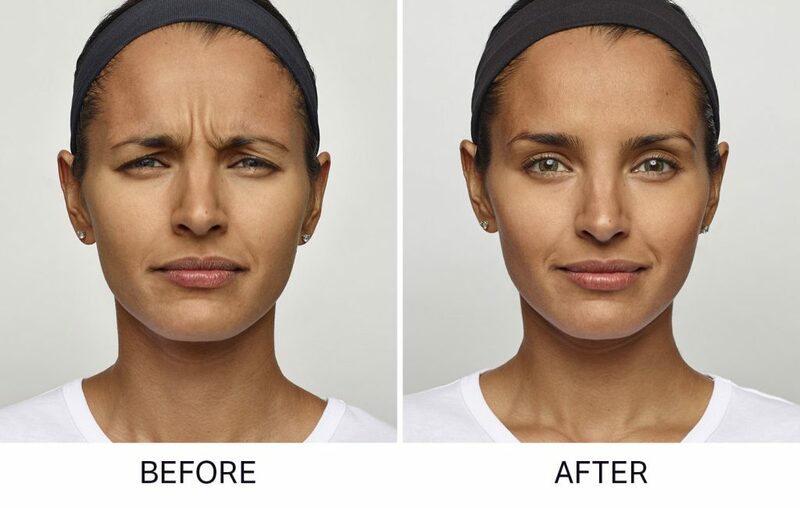 Dysport is botulinum type A neurotoxin injectable that prevents the small muscles around the eyes and brow from making habitual contractions that lead to frown lines and other “dynamic” facial wrinkles. The neurotoxin in Dysport works by blocking nerve impulses in these muscles, causing them to relax. Effects begin to show in as little as 2 days after treatment and last 3 to 4 months on average. Periodic follow-up treatments can help maintain the effects for a longer period of time. What types of wrinkles can Dysport treat? How are BOTOX and Dysport different? The best way to determine which product will better suit your needs is to consult with a qualified provider. Dr. Samaha, Dr. Lee, and our nurse injector, Maryanne Savage, RN, BSN, each have many years of experience with both products and will be happy to help you understand the benefits of each option during a personal consultation. Dysport is often said to be cheaper than BOTOX because it costs less per unit. However, the two products are measured differently, so comparing costs is not so simple as looking at per unit price. Most patients require more Dysport than BOTOX to achieve a similar result. Therefore, the overall price of Dysport treatment usually ends up being very comparable to the price of BOTOX treatment. From time to time, we are able to offer special pricing on Dysport or other injectable treatments. Please visit our specials page or call us at 617.786.7600 to learn about current opportunities to save on cosmetic treatments in Boston. All injections at Boston Plastic Surgery are performed either by Dr. Samaha, Dr. Lee or Maryanne Savage, RN, BSN, our nurse injector with more than 30 years of experience in aesthetic medicine. After reviewing your treatment goals, they will clean the injection sites with alcohol and provide ice packs or topical anesthetic to help you prepare for injections. Through a very thin needle, Dysport is injected precisely into the muscles responsible for forming the wrinkles you wish to reduce. You can return to normal daily activities immediately after treatment, although you may experience some post-procedure redness, tenderness, or bruising around the injection site. These side effects, if they occur, are typically mild and resolve within 1 to 2 weeks after treatment. Most patients experience a noticeable improvement within a few days after receiving Dysport injections, and results continue to gradually improve over the next few weeks. If you are ready to give Dysport a try, contact us for a personal consultation. We will provide a thorough skin evaluation and determine if Dysport or another treatment will best achieve your goals for refreshing your appearance.